My whirlwind trip to Paducah is now a thing of the past. It is hard enough when you travel somewhere only to stay there 2 days, but when the US government gets involved to screw up the air traffic controllers, it is a complete fiasco. Considering that I flew through Newark last Thursday, where average delays were on the order of 4+ hours, I am lucky to have even made it all the way to Kentucky. The show was everything I expected and more. 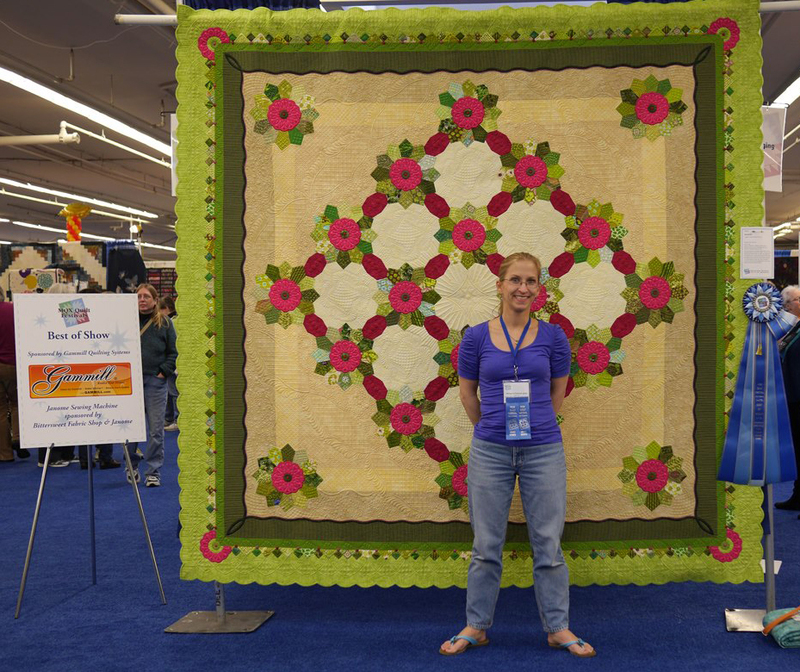 400 of the world's best quilts all under one roof. I really appreciate getting to see the hand-made and hand-quilted quilts also, since this was me 5 years ago. The Japanese dominate the handwork categories, and rightfully so. Their quilts are just stunning. I have opted to not post a ton of photos because the angles that they were hanging made it really hard to get photos of many quilts. If you get a chance to get to this show, even if you don't have a quilt in it, go running. I got 2 quilts accepted..."Intertwined" did not ribbon. I sort of goofed on this one I think. Unfortunately, hindsight is 20/20. 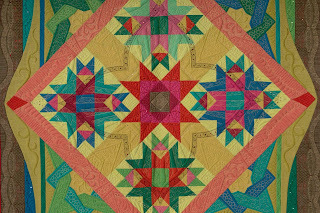 I entered it in the "small quilts - 1st Paducah entry" category, which had 38 entrants. 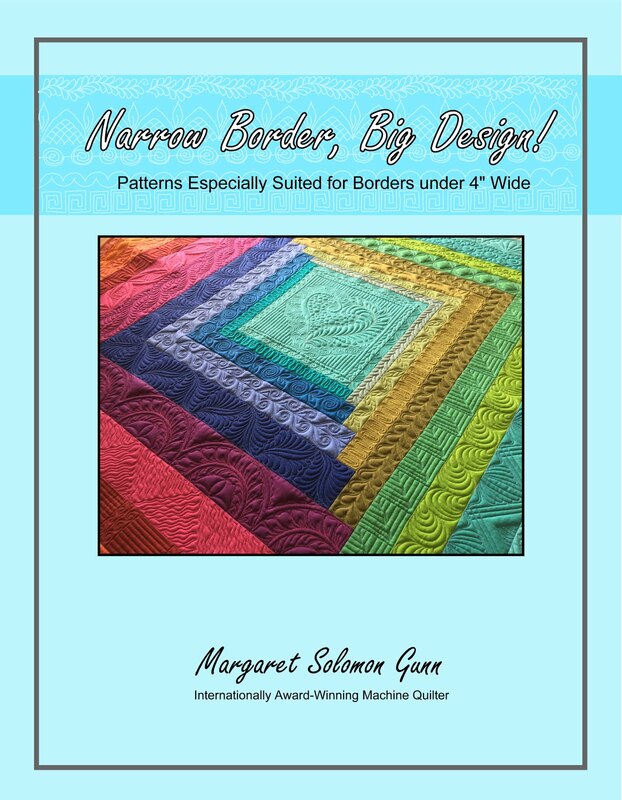 I should have just entered in the "small quilts - longarm quilted" category. I think it may have even placed, as this category had 15 quilts entered. The upshot of this is that I am still eligible to enter it at another AQS show, and I may try it again at Paducah next year. I managed to buy a modest amount of fabric, mostly for my next quilt that is started (the dahlia). I also grabbed 8-10 cones of thread, some hand quilting stencils, a 2014 Quilt Arts calendar that a quilt I quilted last year is in, and a few other odds and ends. I had the crazy pleasure of shopping at Hancocks of Paducah. OMG...if I lived there I'd need another job. No cheap fabric in that place! Time to get busy finishing some client quilts before my kids finish school! Here is a sneak snippet of what I hope to someday be another great show quilt. I have tremendous motivation on this project, as I often do in the early days of each new project. Finishing them always seems to be the hardest. I completely love the fabrics and the colors, and even the fact that I am using way more print on this quilt than I often gravitate towards. I think that it will work. If you saw the last post, you will notice that I changed the corners (which were mini-dahlias). They turned out to be a complete pain to get as a full semicircle. I was frustrated tweaking them, and couldn't keep them at 170 degrees! I went back to the drawing board, and I like these too. My box from MQX arrived yesterday. Just before I left the show 10 days ago, I saw that two of my quilts had been given Teacher's ribbons. Each faculty at MQX is given a ribbon to place on their quilt of choice. I have been given a few of these over the years, and they are a nice treat. Often, they are placed on pretty quilts that didn't place. I used to feel that they were a nice motivator to keep doing what I was doing. Everybody dreams of bringing home a ribbon from a quilt show. Sadly, all entrants don't though. Not all shows have faculty ribbons, but MQX does, and they are a nice touch. While I like the thought that many faculty have in placing them on non-ribboned quilts, I also love it when a teacher just selects quilts he/she really loves too. When you win Best of Show and 2nd place, you certainly don't expect to get a Teacher's ribbon too. It is for that reason that these are very meaningful. 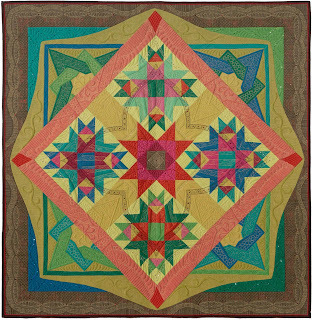 Crystal Smythe (of Intelliquilter) put her ribbon on my small Kaleidoscopic Calamity, 2nd place quilt, while Judy Woodworth put her's on my Rainbow Nouveau quilt. When I know that there are many growing quilters that would have really loved to have gotten these ribbons, I am thankful to have been the chosen recipient. 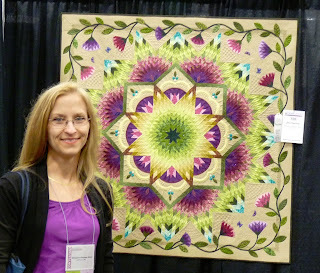 I don't personally know Crystal, but Judy is a fantastic quilter and teacher, and just a delightful soul. Thank you. Now, I really must go and pack for tomorrow's trip to Paducah. I endured the long and silent wait while the awards ceremony took place last night to get word right at bedtime that my Zen Garden quilt took an honorable mention. I'm delighted and most excited to get there tomorrow! 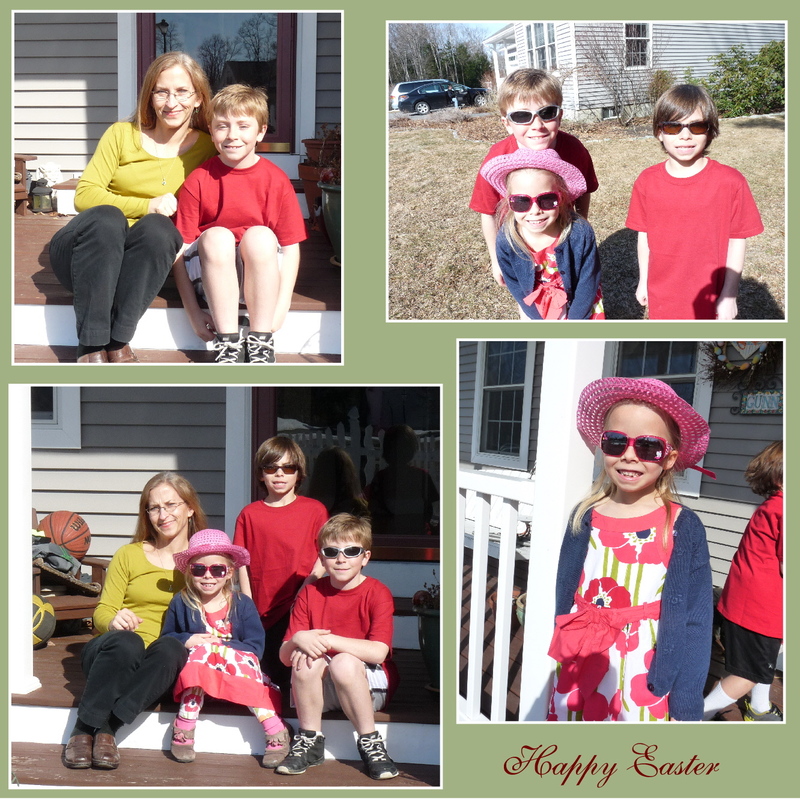 This is the only day this school vacation week that all 3 kids are away visiting Nana. I have work accumulating in the studio, and needed to get things going. April is blowing by fast and my trips here and there are not helping me to get things finished. I did finish a lap quilt late yesterday, loaded another small (but dense custom) wall hanging, which I finished this morning. Before I depart for Paducah, I have a huge E2E to quilt. It can wait for Monday though. Here is a quilt I finished a couple weeks ago. It has made it's journey home to Tennessee already so I will show it. This is a hybrid-type quilt. It's got traditional blocks, but in non-traditional fabrics, all combined with free-piecing of the letters. I didn't want to take the quilting too seriously or make it too formal. The butterfly kind of takes center stage, so it got a visible (variegated colorful thread) trail behind it. Somehow the free-feathers as its background seemed to depict airy flight. The blocks were all done a little differently, but I tried to repeat the quilting if there was a neighboring similar block. Mostly, I took a geometric approach. I used a variegated Rainbows thread on the blocks because they were every color batik under the sun. It allowed me to use just one thread, and still have it seem cohesive. Here's another look. I don't have too much to comment on the quilt. 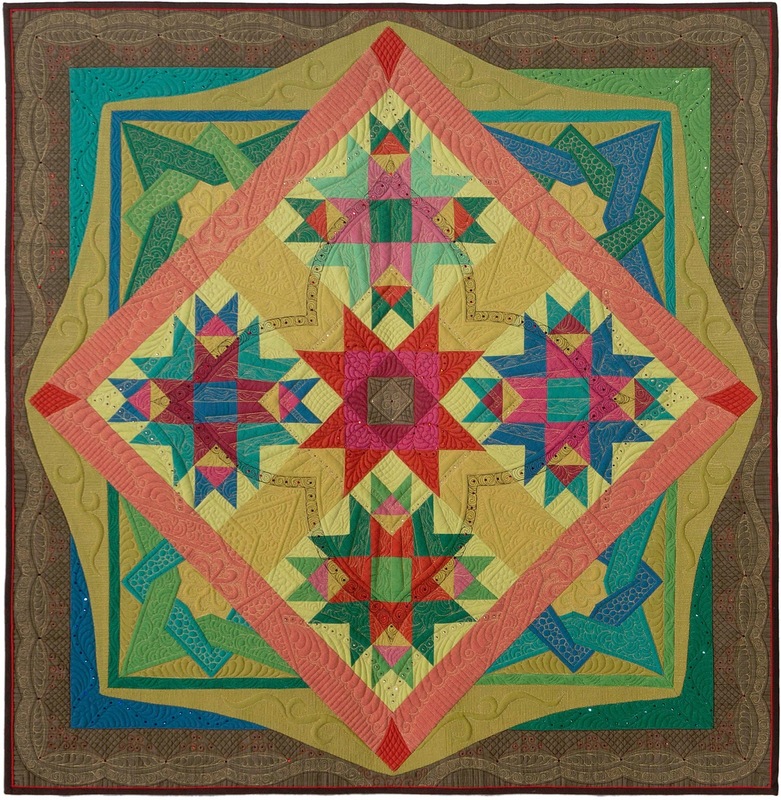 It took me a little outside of my innate comfort box, which for a quilter is a good thing. 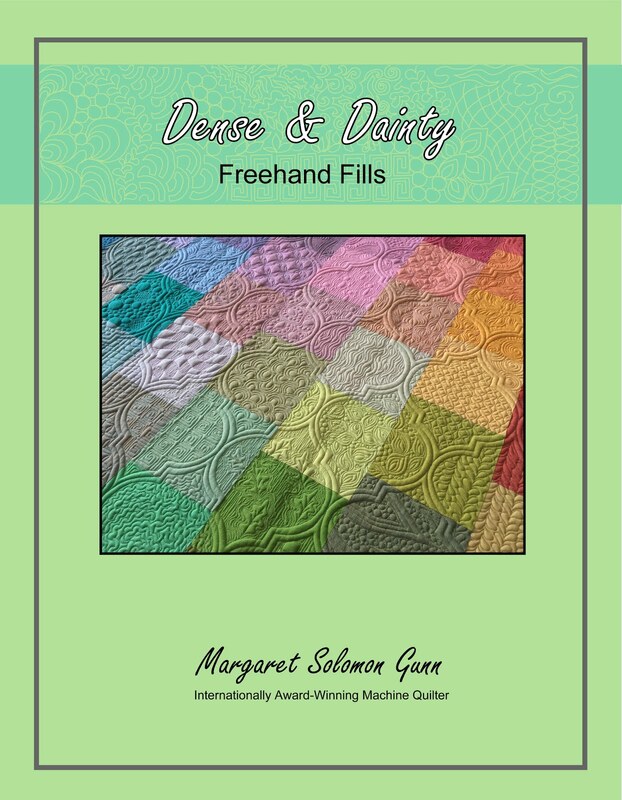 Different quilts keep you thinking of new and different things to stitch. So, like I said initially..."A day to play"...when the wall hanging I was working on was done, I stitched some on this new flimsy. Can't really call it a flimsy yet as it is in a multitude of pieces, but many of the pieces are stitched together now. I had the large center dahlia done a week ago, but now it has 4 smaller babies dahlias. They still need their centers, which I will hand stitch. I am playing with combining the silk Radiance with the quilting cottons. It is a bit of a pain to make the bias strips with, but I think I will like the effect. I love how I have been able to use a couple of fabrics that I really like, but just have never really found a great use for...the pommegranites and the Treetop Fancy. 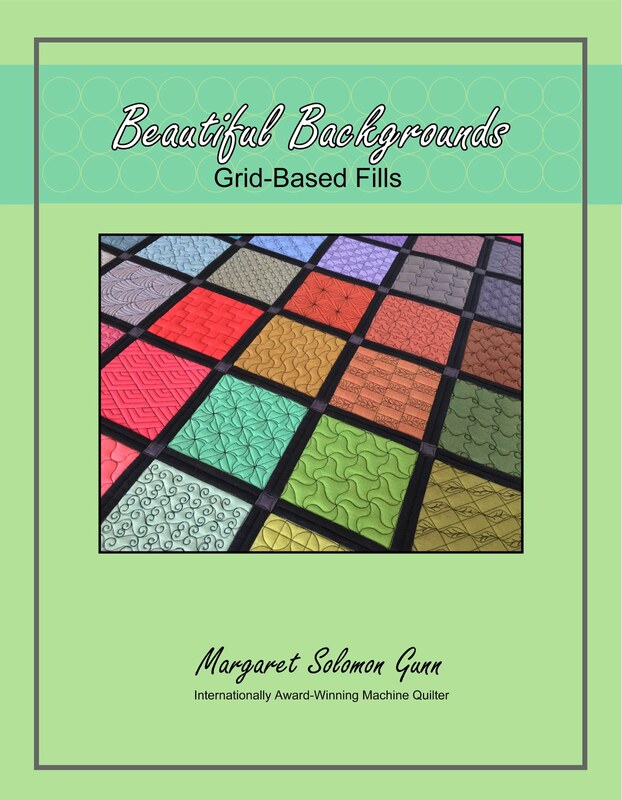 They are perfect in color and texture for this quilt. This quilt will have a ton of hand applique once I get the basic structure of it together (ie, when time stands still and lets me just do what I want to do!!). 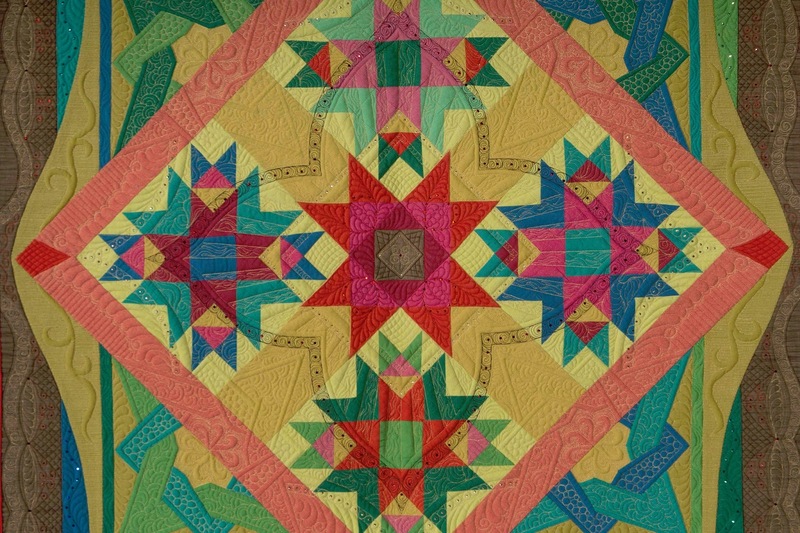 Next week, I am off to Paducah to see my 2 quilts in the show, and the other magnificent 398 quilts that were accepted. I can hardly wait!! 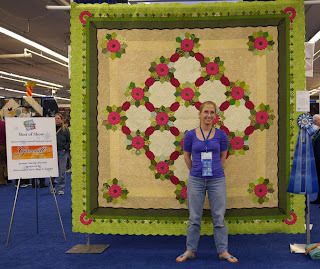 If you have read and followed my blog lately, you know I have been gearing up to go to the Machine Quilter's Exposition (now called New England Quilt Festival). This is my favorite quilt show that is within a reasonable trip distance from where I live, and I look forward to going each year. Today is the last day of the show, and I am now home. Need less to say, it has been a whirlwind trip full of every emotion imaginable. I arrived Wednesday morning. Judging was all over before then, and I did actually post full pictures of the three quilts I have entered on Facebook. I knew before driving to Manchester, NH that I had earned a ribbon. No details were provided to us winners, though, about which quilt earned a ribbon (if we entered more than one) or what the placement was. It didn't really matter. I had a ribbon and I was more than content. I arrived early enough in the morning that I thought I might help with the quilt hanging before my afternoon class. The pre-show scene was pretty chaotic, though, and I was tired, so I decided to just wait for my class. In hindsight, it is probably a good idea because they might not have let me in there anyways! After my class, which I can go into in another post, was the awards ceremony. It was fun to get to see friends I'd met last year at the show, and to meet facebook contacts that I've messaged with. I asked one of the gals that was helping hang quilts, and she assured me that my quilts were all hanging nicely. I'd worried a bit about my largest one, "Big Bertha" because it's 99"x99" and I have only seen it hanging once, and wondered how it would do. Early in the awards ceremony I got a 2nd place ribbon for the quilt I expected to get something for (my small quilt showed in a previous post). I had peeked through the show book in the afternoon and knew that the competition in the categories of my larger quilts was very stiff. It seemed unlikely that I'd beat enough of them to ribbon. All was good - I had the ribbon. They got through the awards for all the categories, including the ones for my larger quilts - and as expected the ribbons went to the quilters I figured would get them. Quilting can be really predictable in some ways. Then they got to the "big" awards...best quilting, best embroidery, etc. I was pretty sure I wasn't up for any of these. Now I can be like a card shark at Vegas too. Because I had looked through the show book, I knew who of the "big hitters" had not gotten anything yet (but often do). 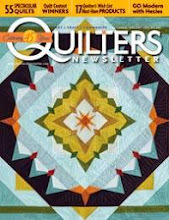 Often it is these quilters that take the bigger awards. Sure enough, one by one, they were given out. 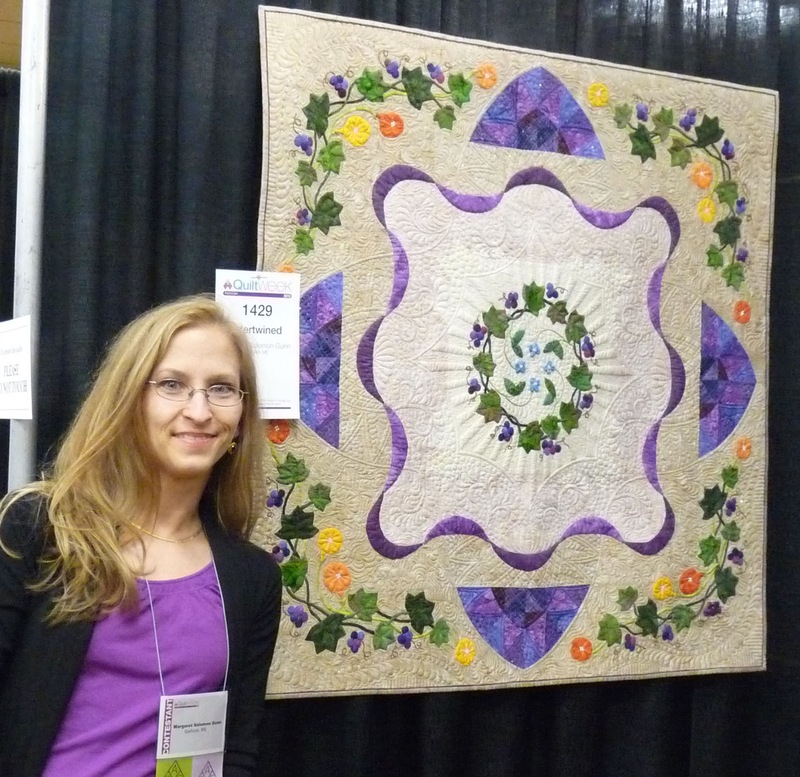 I had two quilters left in my head that I suspected might be up for the last award, Best of Show. Not once did I even consider it could be me. Seriously, not once. 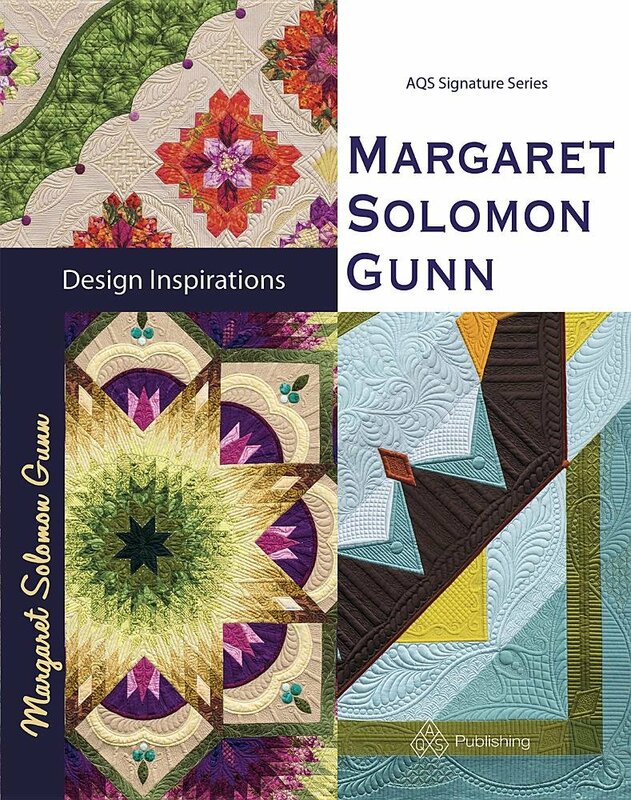 I couldn't see how my quilt could beat the greats like Marilyn Badger, Janet Stone or Gail Stepanek/Jan Hutchison. Heck, all of these had quilts in Houston, with ribbons. They are phenomenal. But then, I also knew that they'd already taken placements in their respective categories, so there were only a few choices left. I'm telling you, when they called my name I think all the blood left my head. Shock set in. Part of me thought I was dreaming. Winning Best of Show was not anywhere my radar, certainly not at MQX. I am shocked, surprised, elated, and a thousand other words. This award is mine this year. Mine. I am delighted that three judges critiqued my work, and got me. 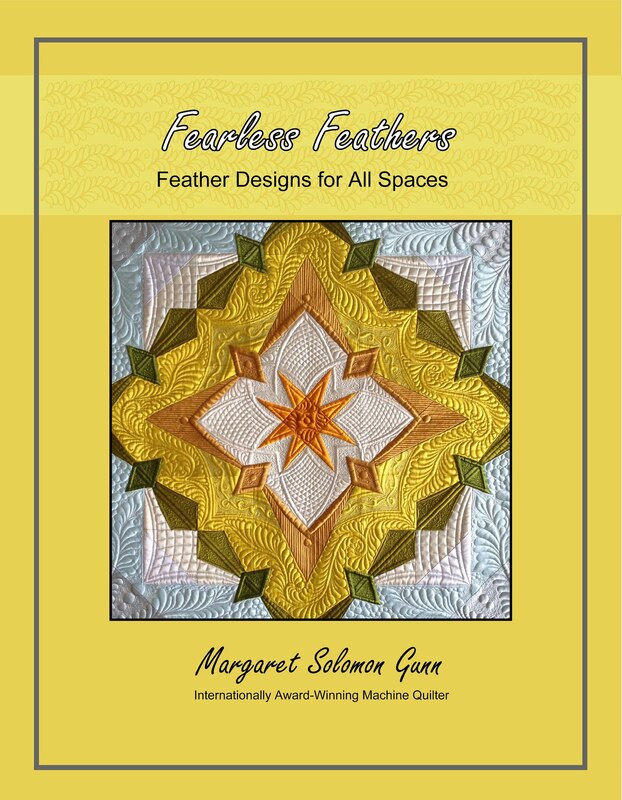 They understand and like the choices of quilting that I designed. I listened to head judge Scott Murkin explain the quilting designs I used to a class of his students. They were on a guided tour of winning quilts. I had a thought process for what I chose, and I'm thrilled that they saw that. I'm not a one trick pony (or I try hard not to be)...I am constantly trying to open my boundaries as a quilter and select new motifs. It can be risky, but worth taking that chance. One of the biggest selling features for this quilt was most definitely the 106 scallop binding! It is the first of this type that I have done. I consulted with judge Linda McCuean on the binding early in the winter, since I have seen several of these that she has done. She gave me fantastic pointers, and about 45-50 hours later, the binding was done. It compliments the Dresdens exactly as I envisioned. 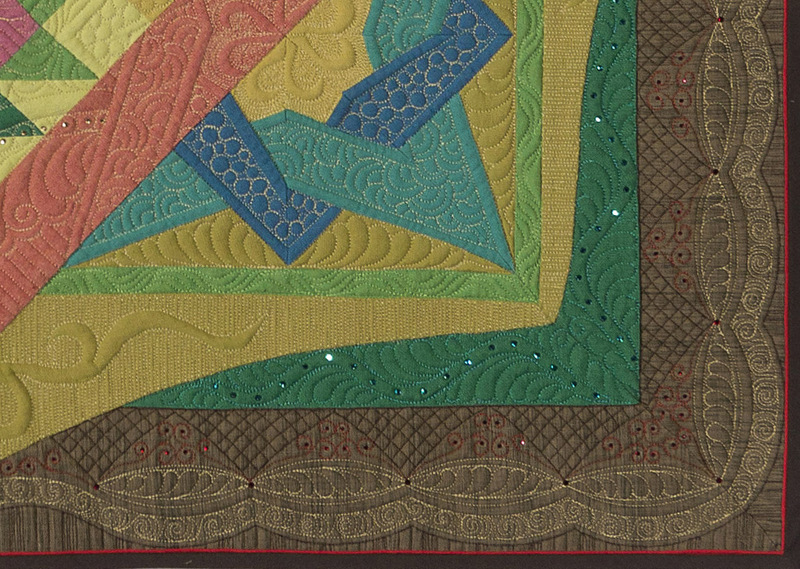 Despite a LOT of work, this binding sets the quilt apart and I am delighted to have chosen it. I know that there are many times when I just want a quilt done, but I am the Tortoise here, rather than the Hare. I just don't rush the making of my own show quilts. There are many "Instant Gratification" quilters out there, and I envy their ability to not overthink projects and just get them done. I am not that person. Approximately 22 months after starting the quilt, it is at it's first show. I estimate that this quilt took me between 600-700 hours from start to finish, cutting, designing, ripping, hand stitching nearly everything, marking the quilting motifs, quilting and binding. There were many days I had issues with this or that, and I posted things to facebook. I love and cherish all the great comments I got. They gave me the determination to make the questionable change, and keep working on the quilt. The dark green bias with pink piping was added primarily to cover the edge of the checked fabric. It wasn't printed on grain, and the edge appeared "wavy", like I cut it crooked. I love the fabric, and loved it on the quilt. Since changing the check was not an option in my mind, adding something to cover it up was the order of the day (or week, as the Tortoise works). In the end, it was a fantastic addition to the overall design. The triangles of the outer border were started as traditional prairie points too. I was on a mission to recreate a traditional quilt but with a modern twist. Turns out I really do HATE prairie points, and I ended up appliqueing them down. More so, to modernize the look, I thought it needed the pops of pink so I hand stitched over a hundred tiny dots to the border. I hope you enjoy learning the ins and outs of how I choose designs. I know I didn't post a ton during the construction of this quilt, but am happy to share it now. The last few days have been overwhelming getting to meet so many of the folks that have followed this quilt either here or on facebook. I cherish the many congratulations and hugs received this week from all of you. Those complete strangers that go to the trouble to introduce themselves to hug me are delightful. Being a somewhat reserved person, the experience leaves me grateful for the outgoingness of the rest of the population. Thank you. 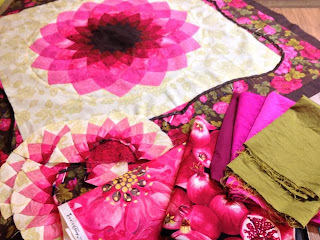 Fabrics...over 50 modern or semi-large scale green prints, all solids for background and outer border are Michael Miller Krystals, quilted with 3 shades of silk thread, and highlights in red on the flower centers are in 40wt trilobal poly. I used QD wool over Hobbs 80/20 batting. The dark green bias wave and prairie points are machine appliqued, but every Dresden and dot are done the old-fashioned way (aka needle turn). FYI - the Tortoise loves handwork :-) It was on the frame a total of 6-7 weeks for quilting, for a total of 175-200 hours. Remember, it is 99" square finished. All quilting is free-handed (no computer). All photos here are compliments of the great Jeffrey Lomicka - MQX photographer extraordinaire. I know, I know...I am a week late. Or 51 weeks early. I knew when this was sent to me that I wouldn't be getting it back home to her before Easter, but that was OK. She was working on it nearly a year ago before they got relocated from Maine to Alaska! 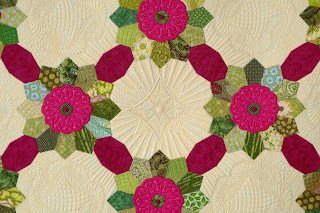 The circle flowers will get buttons attached to them; that is why I didn't quilt anything on them. I think it turned out super cute. I used an ivory Glide on most of it. It has a sweet and delicate sheen. Then at the end, I came back over the 2nd tan border and the greens with a variegated Rainbows thread, which also has a slight sheen. You can see where I added just a subtle hint of this Rainbow thread in the picture below. More free-form feathers. I guess when I find a filler that I like, I use it. It is pretty here, and this pink background really didn't scream for a more structured feather. It is a playful and light-hearted look. The bunny will also get features added when it goes home. Only because this is my Easter post...here's a quickie look at our most casual Easter...My daughter likes to gussy herself up, but it's a hopeless lost cause for her brothers. Boys will be boys. Have a good week. Not sure I'll post anything until I am back from MQX next weekend. 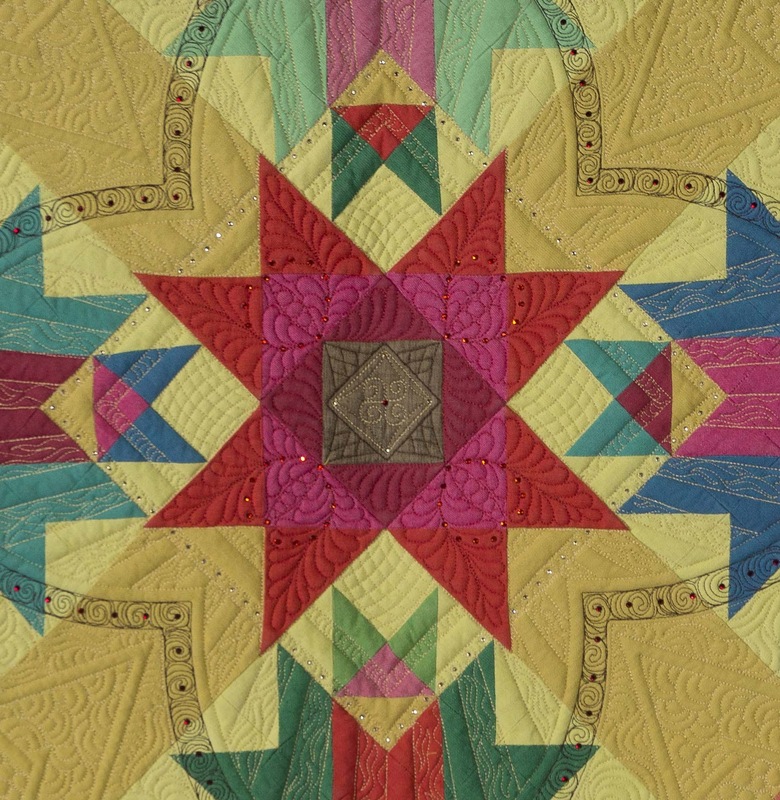 For those of you within driving distance of New Hampshire...This week is the Machine Quilters Exposition in Manchester, NH. 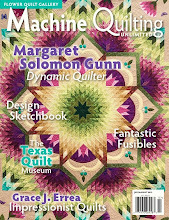 It is a great machine quilting quilt show. I have hesitated about introducing this quilt in its entirety before it goes to show next week, but decided what the Hell. Why not?! Without further adieu, here's "Kaleidoscopic Calamity". It has had a number of possible names ranging from Experimental Solids to A Colorful Co-mingling, and a few that are not appropriate for print! What started as a desire to make a quilt solely from solids has now been put to rest. I no longer yearn for this any more. These are not true solids; they are Moda Crossweaves. They have one color in the warp, and another in the weft. They turned out to be thicker to work with than I like, making accurate points hard. When I selected them, for some reason I had them confused with shot cottons. Dumb me. Specifics...this quilt is 35"x35", my smallest to date. 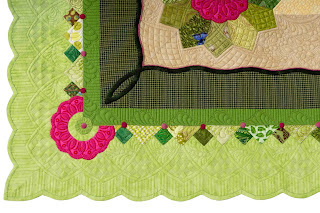 You can double click any picture to see the quilting details. I used the usual show quilting batting recipe - Hobbs 80/20 with Tuscany wool. It's stitched with threads Monolon and Glide in several colors. The shine is pleasing on the otherwise dull fabrics. I chose to quilt the center of the quilt "free-form", as in not adhering strictly to the piecing (now, that would be boring, eh?!). This was definitely a quilt of learnings. I much prefer things to work out right the first time, without picking out. Seriously, who doesn't. I designed the star block. It seemed simple enough. It was just intended to be rotated onto point for the quilt layout. I constructed it in rows, very neatly pieced. (you will notice that if you turn your head 45 degrees, the piecing looks much neater). Problem is that when the block is turned on point, it doesn't look quite as neat. Learning #1: Piece blocks in the orientation that they will hang so that horizontal and vertical lines appear straight. Needless to say, I did not undo these blocks. This quilt was already losing my interest by then. I am surprised I did actually finish it! Here's a closeup of the star...Small quilts call for tiny, intricate quilting. Not really sure how many hours I spent on this but the number is insane for it's small size....probably 35-45. Or more. Yup, probably much more. It's like childbirth...your body is programmed to forget certain things that would otherwise be disturbing. The outer border is my favorite part. The quilting happened to stitch beautifully that day, and I loved the look of the motifs I chose. Maybe a judge will feel the same. Fingers crossed. I know areas that have plenty of issues, but this border is not one of them. The back is strips of leftover green. It's not really symmetrical, but does that really matter? It shows the quilting really well. Since these pictures were taken, crystals were added to the back too. You never know, if it ribbons, it may hang with the back showing. Cross your fingers and wish this Calamity luck. The competition and quilty company at MQX next week looks daunting. I have a quilt in 3 different categories. My guess is that this small quilt category (under 40" side) may have the best chances. But who really knows!?! The news will all be out next Wednesday evening.